Peru, a country in Western South America bordered by Ecuador, Colombia, Brazil, Bolivia, Chile and the Pacific Ocean has a total land area of 496,225 square miles and a population of around 29.5 million. Peru is a developing country with a high Human Development Index. The major sectors of its market-oriented economy are services, manufacturing, extractive industries and taxes. Gold, copper, zinc, and textiles are the major exports of the country. The Andes and the Humboldt Current causes climatic variations to the otherwise tropical country. Most prefer to visit Peru during January through March. 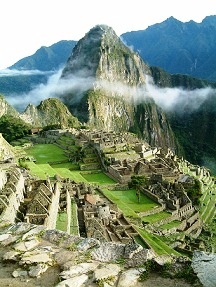 Its colorful history from the Inca times is a major draw-card for visitors. The major attractions are Machhu Pichu, Sacred Valley, Lake Titicaca, Cuzco, Lima, and Puerto Maldonado. Its breadth in art, literature, music and cuisine allows for a unique cultural experience. Peruvian cuisine is influenced by Spanish, African, Arab, Italian, and Chinese cooking and is famous for the wide range of plants and animals considered for cooking. Peru Eyewitness Travel Guide 978-0756661885 $17 Excellent pictures. Ideal for use during and after the trip. It is not so suitable for planning a trip as there is not a lot of practical information. Peru Map by Borch 978-3866093546 $11 Laminated. 1:1,750,000 Scale. Includes inset map of Peru Amazonico, Gran Lima, Central Lima, Gran Cusco, Central Cusco, Arequipa, Ayacucho, Trujillo, Chan Chan, Sacsayhuaman, and Machu Picchu. The first stamps of Peru were a set of two stamps released on December 1, 1857 in the Marine Transportation theme. The set (Scott #1 to #2) catalogs for around $1600 mint and around $3100 for used. The designs show sail and steamship, and ship sailing Eastward. This issue was followed by several sets in the Coat of Arms theme until 1866. Those sets (Scott #3 to #15) are all valuable cataloging in the hundreds of dollar range. Issues featuring llama and a locomotive and arms design were the primary stamp issues of Peru during the period till 1873. Those sets are also valuable fetching in the tens of dollar range although there are plenty of counterfeits in the market as well. Peru released a set of nine stamps between 1874 and 1884 featuring a design of the Sun God of the Incas and the Coat of Arms theme in a number of different designs. The set (Scott #21 to #29) catalogs for around $25 mint and around $9 for used. Peru declared independence from Spain on July 28, 1821. It was recognized by Spain on August 14, 1879. Peru released a set of nine stamps in 1907 in the History theme. The set (Scott #168 to #176) is sought after and catalogs for around $300 mint and around $100 for used. The designs show Monument of Bolognesi, Admiral Grau, llama, Statue of Bolivar, City Hall in Lima, School of Medicine in Lima, Post and Telegraph Building in Lima, Grandstand at Santa Beatrix Race Track, and Columbus Monument. A set of fifteen stamps released on January 18, 1935 to mark the fourth centenary of the founding of Lima. The set (Scott #324 to #331 and #C6 to #C12) catalogs for around $65 mint and around $45 used. The designs show Pizarro and the Thirteen, Lima Cathedral, Belle of Lima, Francisco Pizarro, and Veiled Woman of Lima. Francisco Pizarro Gonzalez was a 15th century Spanish conqueror who founded Lima, the capital. A set of twelve stamps released in February of 1943 to mark the fourth centenary of the discovery of the Amazon River by Francisco de Orellana in 1542. The set (Scott #394 to #405) catalogs for around $20 MNH and around $8 for used. The designs show map of South America with Amazon as Spaniards knew it in 1542, Gonzalo Pizarro, and an allegory showing the discovery of the Amazon River. Francisco de Orellana was a Spanish explorer who completed the first known navigation through the length of the Amazon River. A set of thirteen stamps released between 1979 and 1980 in the War of the Pacific theme. The set (Scott #687 to #698) catalogs for around $12 MNH and around $9 used. The designs show Battle of Iquique, Col. Jose J. Inclan, Corvette Union running Arica Blockade, Battle of Angamos, Aguirre, Miguel Grau, Perre, Lt. Col. Pedro Ruiz Gallo, Marshal Andres A. Caceres, Naval Battle of Angamos, Battle of Tarapaca, Adm. Miguel Grau, Heroes Crypt, Col. Francisco Bolognesi, Col. Bolognesi’s Reply by Angeles de la Cruz, and Col. Alfonso Ugarte on Horseback. The War of the Pacific was a pivotal military conflict between Bolivia and Peru against Chile whereby Bolivia ultimately lost its coastal areas and Peru lost several areas to Chile. A set of three stamps released on June 20, 1991 showing the second Peruvian Scientific Expedition to Antarctica. The set (Scott #1005 to #1007) catalogs for around $5 MNH and around $3 for used. The designs show penguins and man, Peruvian Research Station in Skua, and whale, map and Research Station. The first coins of Peru were issued as early as 1545 following the discovery of large deposits of silver. Silver coins continued to be issued till 1752 with many interim breaks - cob style coins dominating the scene during the last 68 years. In the modern era Spanish Milled Coinage (16 Reales = 2 Pesos = 1 Escudo) debut in the latter half of the eighteenth century. Certain Provisional Coinage, Royalist Countermarked Coinage, Issues of the North and South Peru also appeared during the 19th century. Many of those issues are highly valued in high grades. Republic Decimal Coinage (100 Centavos – 10 Dineros = 1 Sol, 10 Soles = 1 Libra) debut in 1863 with the introduction of Copper Nickel Centavos with the Sun Symbol and Date in Obverse and Denomination and Wreath in Reverse. The issues had high mintage but are still values in the $20 range for UNC. The first gold coins of the modern era were 0.0475 troy ounce half escudos stuck in Lima in 1814 showing the Bust of Ferdinand VII in Obverse and Crowned Arms in Reverse. They trade at a sizable premium over bullion value. Peru has released a number of gold coins over the years and they are valued at a premium over bullion value. Coins $1 and up Common Centavos and Centimos in UNC start around $1. Silver UNCs from the 1960s and prior dates starts around $10. 18th Century Real Cobs in VF, 19th Century Silver UNCs, Silver Proofs Sols from the 1990s, etc starts around $50. Commemorative 3-metal patterns from the 1990s, Gold Coins, Early Silver Coinage in High Grades, etc go well into the 100s. Paper Money $1 and up Recent UNCs starts around $1. Recent UNC Sets, Consecutive UNCs of 5-pieces or more, etc starts around $10. UNC Bundles, High Value Sets, etc start around $50. High Value Bundles, Rare Specimen Banknotes, etc go well into the 100s. Pottery, jewelry, textiles and sculptures are the main souvenirs from Peru. Jewelry $1 and up Friendship Bracelets start around $1. Sterling Silver Bracelets, and Earrings start around $30. Pink Opal Rings, Pendants, etc start around $100. Art $10 and up Antique local scenes and personnel prints start around $10. Handmade Clay Pottery start around $25. Vintage original paintings, sculpture, and figurines start into the 100s. Antiques $10 and up 19th century maps start around $10. Chimu-Inca textile bags, Amazon Indian Drums, Peru Indian Ayahuasca paintings etc start around $100. Miscellaneous Collectibles $10 and up Mineral specimens start around $10. Handmade Hard Clay Antique Dolls start around $30. Andes Floral Folk Art Tapestries, Religious Oil Paintings, Large Rhodonite and other mineral samples start into the 100s.